The Kraken, legendary sea monster introduced to us by the Norwegians, has nothing on Powell 1548. The Kraken eats sailors, boats, and whales. Powell 1548 is eating my garden. 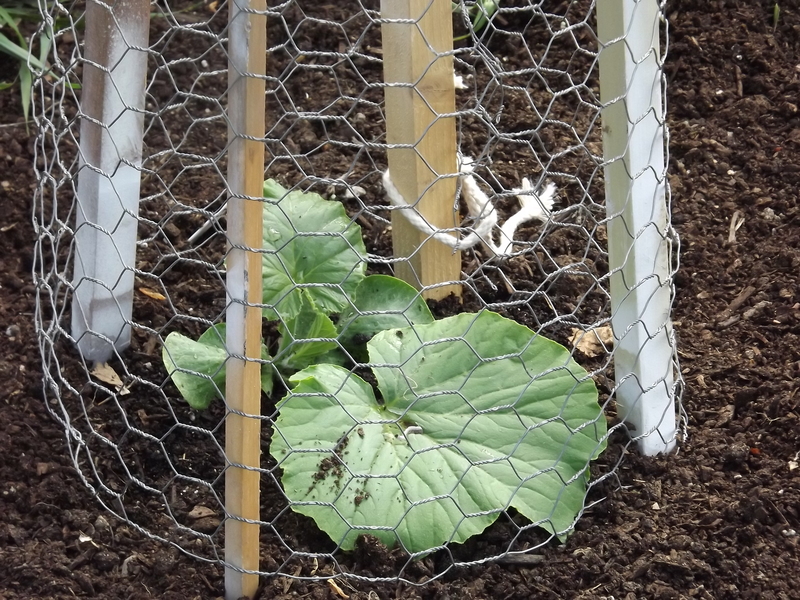 I need to catch you all up on the caging, the release, and the explosive growth of this pumpkin plant. It is awesome to behold. My excuse for not posting earlier? I plead Summer In Maine, when residents work feverishly to treat visitors to our spectacular state in the manner they deserve. A stream of guests to our Barn Loft apartment, the stream of visitors to Husband’s art gallery, the frequent art students that set up their easels in my garden – all demand and deserve attention and appreciation. (If you want info on any of our businesses, contact me by commenting on this post. We’ll talk.) It is a busy time of year for us and all Mainers. That’s the excuse. No more. Powell 1548 is going to require constant updating, because you cannot believe what we’re witnessing. It’s going to take 3 posts to do this. This post will show the growth of the vine, the next post will show the fertilization process, and the third catch-up post will show how The Chosen One is busting out all over, even though it’s August and not June. 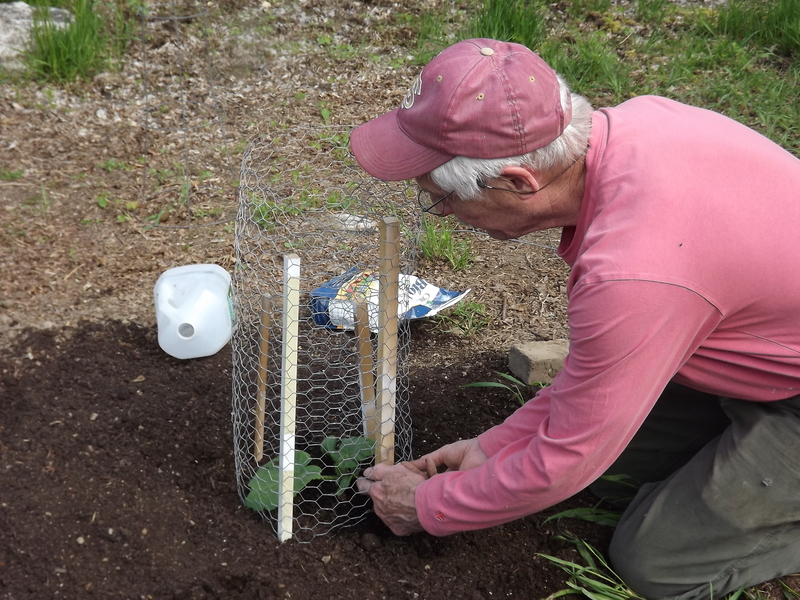 The tiny cage that was first erected around the vulnerable seedling had to be enlarged to accommodate the growing plant. 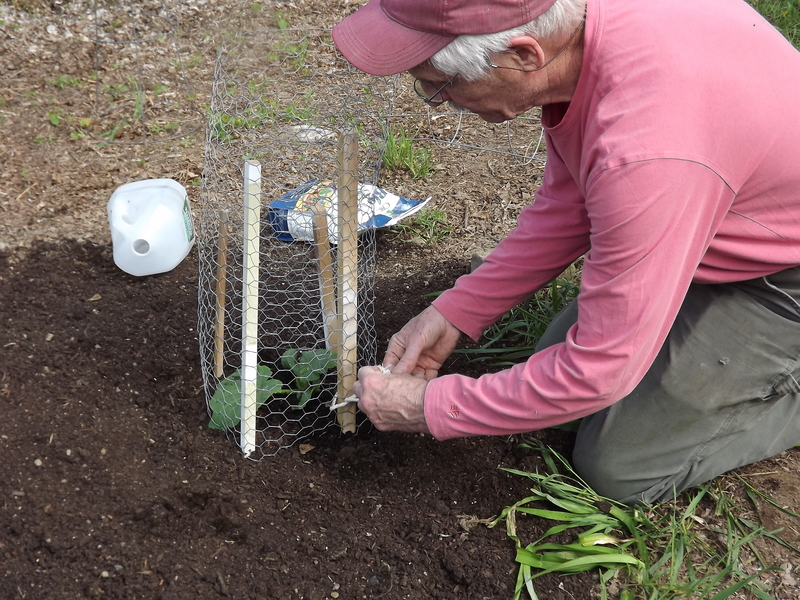 MH the Grower moved the stakes and used a larger length of wire fencing. Full disclosure: My cupcake is also a thief. Shortly after that photo was taken, she uncharacteristically tried to walk off with the jar of bone meal in her mouth. She dropped it on command, but she looked mighty disappointed. A Kraken has nothing over the power of those sad, sad eyes. Powell 1548 was almost immediately banging on the chicken wire door. Daenerys Targaryen may be George R.R. Martin’s Mother of Dragons, and Breaker of Chains, but the Powell 1548 is the Mother of Vines and Breaker of Chicken Wire. MH the Grower released the Kraken, aka the mighty Atlantic Giant pumpkin plant. Correction: Not all are intimidated. Enter MH the Grower in the next post. He has the power to choose, and he had his eye on one particular blossom. Stay tuned…. Pumpkinfest, 2016: It’s the Great Pumpkin, Damariscotta! And so it begins, another rollicking edition of the Damariscotta Pumpkinfest & Regatta, and I am more than just a delighted spectator this year. 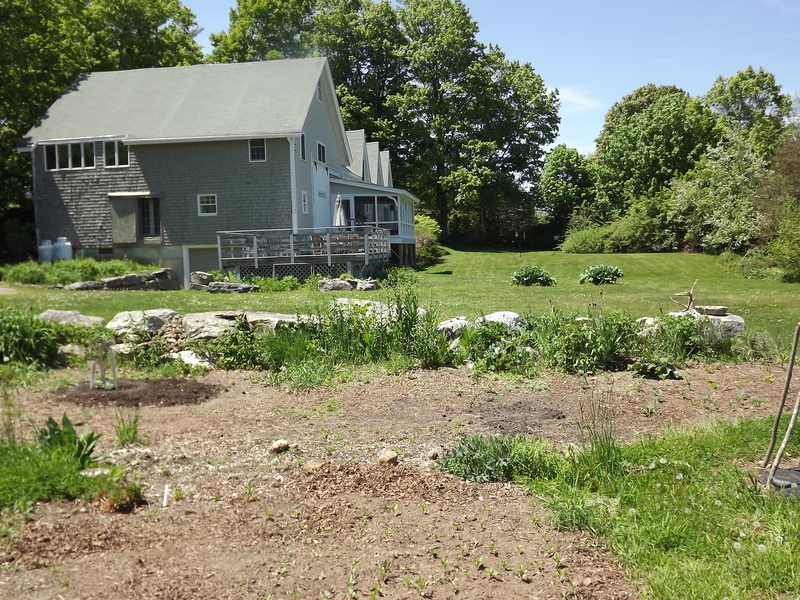 I made a grand bargain with neighbor and friend Michael Horst: I’m giving him a sunny 20’ section of my garden and he’s giving me permission to blog about this enterprise to my heart’s content. And, whose heart wouldn’t be content to follow the progress of the growing of an Atlantic Giant pumpkin?! This event involves the entire community. 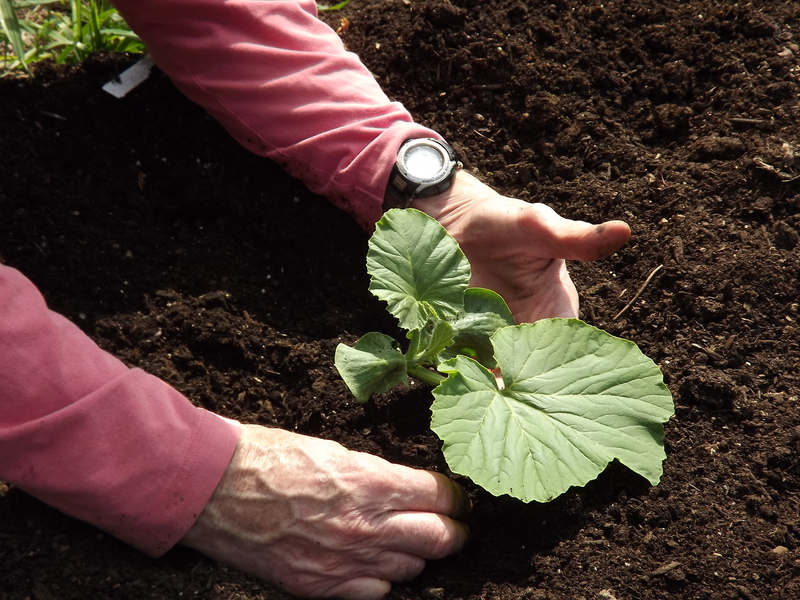 Adults and children volunteer to grow the pumpkins. The pumpkins are grown and then weighed, prize money is awarded, the pumpkins are deployed throughout the town, and artists decorate them with wild abandon and enthusiasm. Some people turn their giant pumpkins into boats fitted with outboard motors and race them in the harbor. (That’s the “Regatta” part of the event.) Businesses and non-profits support the event, sponsor the artists, organize parades, hire street musicians, arrange for giant slingshots to hurl pumpkins great distances, and set up giant cranes to drop pumpkins from great heights. It is a lively time. Pumpkinfest takes place over Columbus Day weekend, but let’s not get ahead of ourselves. 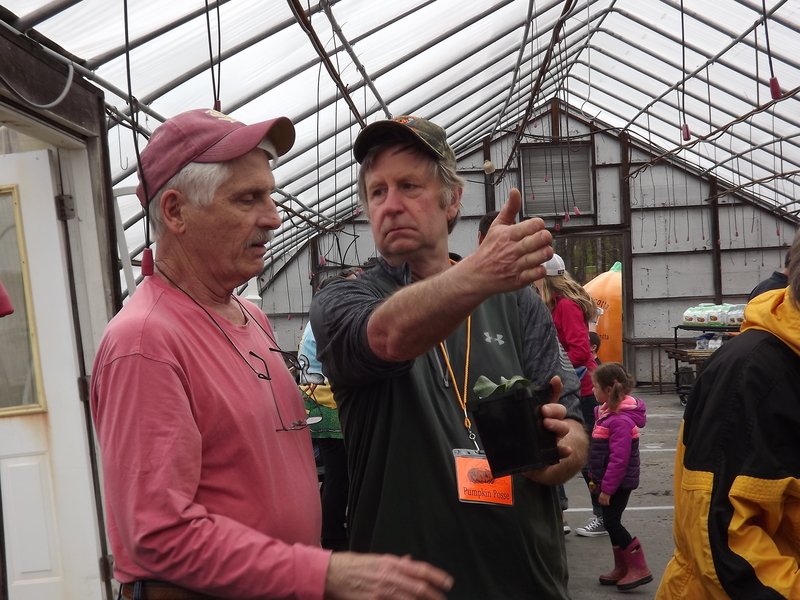 This past Sunday was “Seedling Sunday”, when 600 Atlantic Giant pumpkin seedlings were given away to Squashbucklers (formerly known as “Volunteer Growers”). 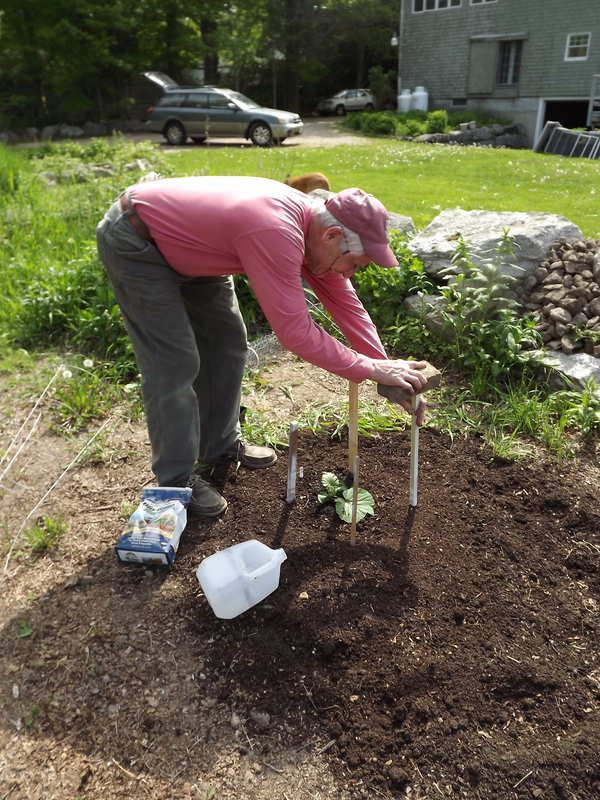 The seedlings were distributed at Pinkham’s Plantation, a local nursery, and the Squashbucklers were also given growing instructions and five gallons of compost to give the tiny plants a healthy start. 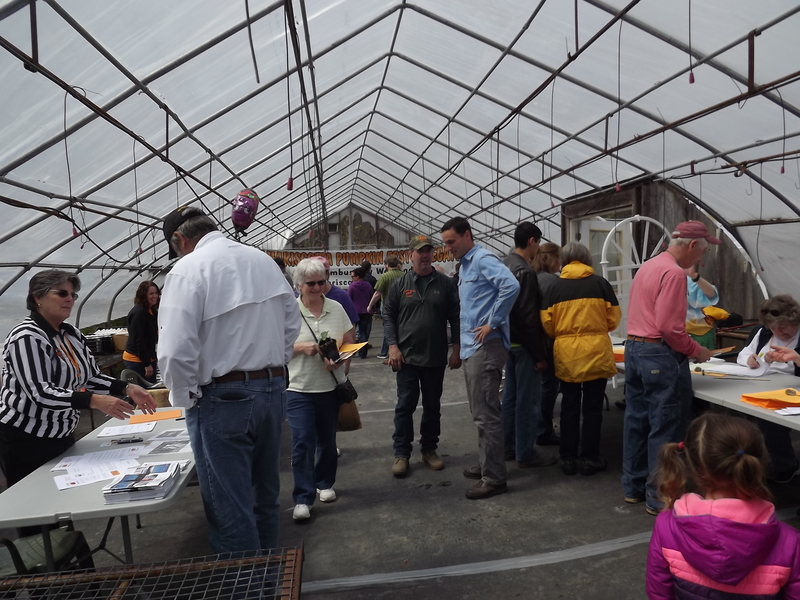 Other notables included representatives from the sponsoring Farnsworth Art Museum, the Boothbay Railway Village, and local media personalities. The real draw for the Squashbucklers, though, was the lure of the seedlings and the expert guidance of the Pumpkin Posse, the volunteers who assist in every phase of this 6-month long event. 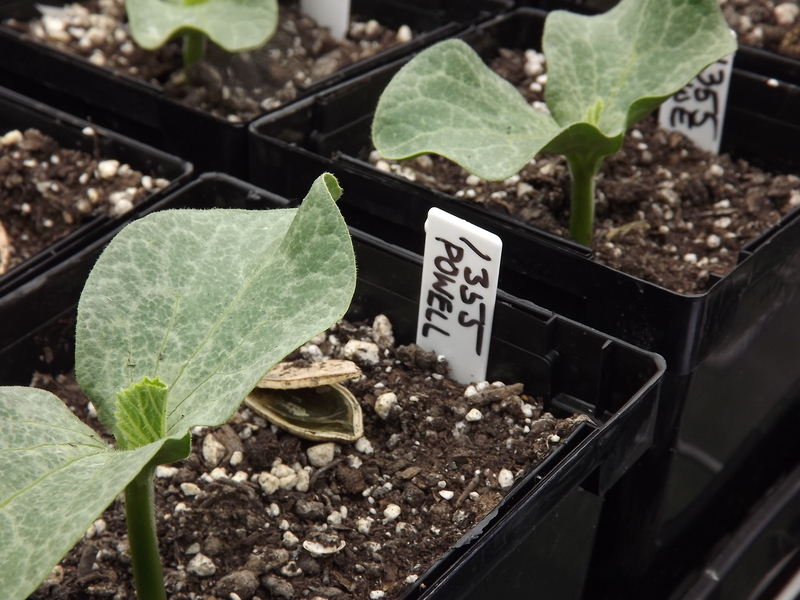 The seedlings are donated by the previous year’s growers, who are ferociously proud of their hefty pumpkins and the genetics that produced them. 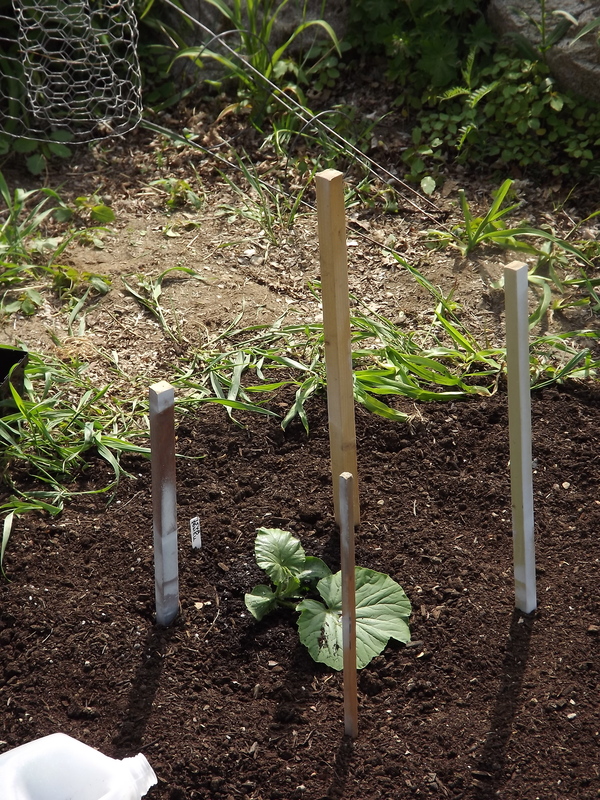 Each seedling is marked with the grower’s name and the weight of the pumpkin from which the seeds were harvested. Much like a champion racehorse, you can select your seedling by its breeding and its trainer (grower). This seedling was grown by Powell, and came from a monster weighing 1,355 pounds. My friend selected a “Gabourey” seedling, and a “Pierpont” seedling, which was grown by last year’s winner of both the Pumpkinfest weigh-off AND set a new record for the state of Maine at 1,727.5 pounds. 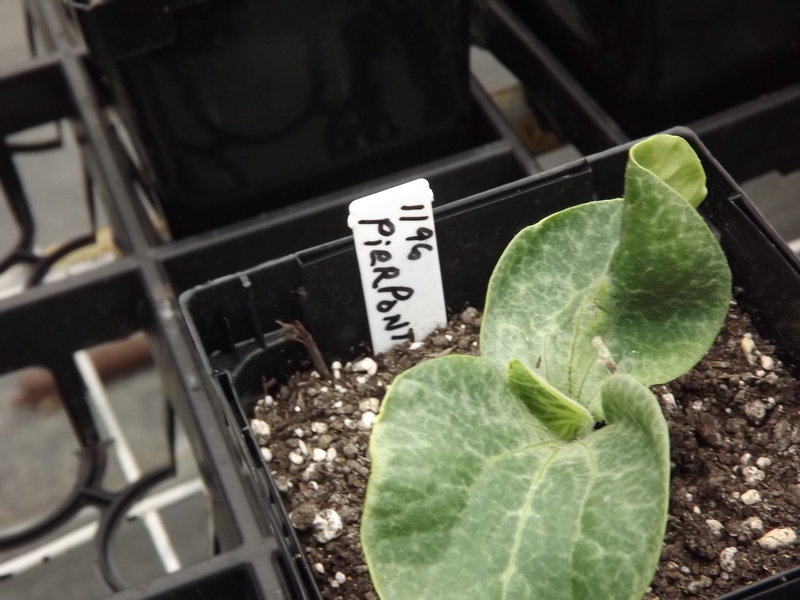 Michael’s “Pierpont” seedling came from a pumpkin that weighed 1,196 pounds. An impressive bloodline, for sure. He was instructed by an expert about what to watch for in Vine Direction. The orientation of the fruit to the vine is critical. More on that later. Michael prepared the planting site in my garden. It has been dug, de-rocked, and a half-yard of fluffy, gorgeous black organic compost is now in place. Soon either the Gabourey or the Pierpont seedling will be planted. Stay tuned! 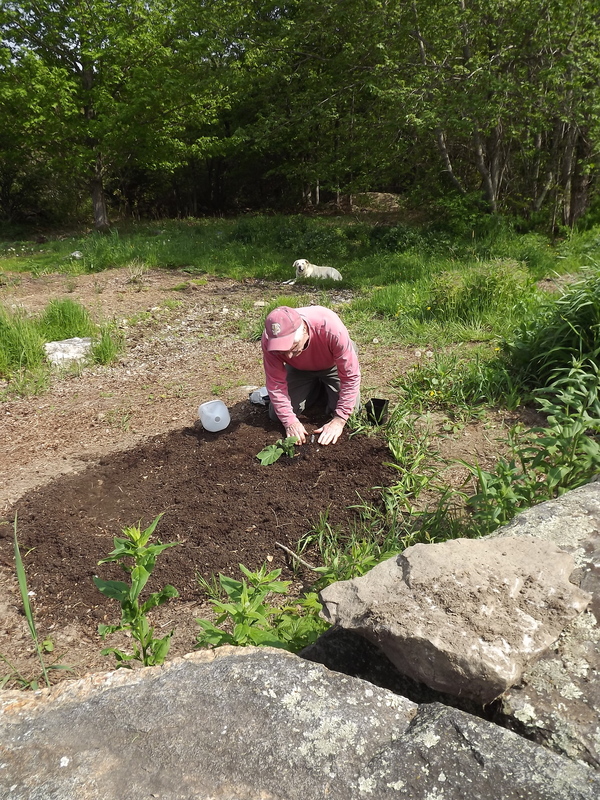 This blog will carry photos and commentary on all aspects of this particular seedling’s moment in the sun.